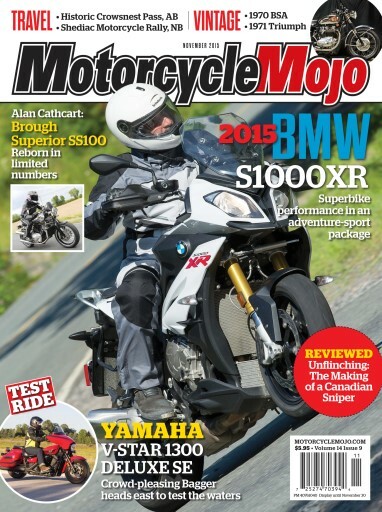 The long-anticipated arrival of BMW’s new S1000XR adventure-sport tourer, has Costa Mouzouris testing the bike close to home for a change at the Canadian press launch in Ontario cottage country. The long-haul capabilities of the Yamaha V-Star 1300 Deluxe SE are put to the test on a 4000 km, hard riding road trip across some of Canada’s most picturesque roads. Our travel stories this month take us over the historic Crowsnest Pass in Alberta with Liz Jansen, and Michele Hengen tours temperate Southern British Columbia at the start of the spring bloom, discovering an ideal getaway for motorcyclists and budding photographers alike. We’ll also take a tour out to the east coast, where editor Glenn Roberts pays his first visit to the Shediac Motorcycle Rally. This month’s edition of Unobtainium once again proves Alan Cathcart must have been blessed with mind control powers at some point as he has convinced the fellows at Brough Superior that he should be the first person (inside or out of the factory) to properly assess their reborn SS100. We’re bringing you two fine examples of British engineering in this month’s Vintage section, courtesy of Greg Williams. First, a 1971 Triumph that tends to check in on its former owner from time to time, and secondly, a 1970 BSA A65 impeccably restored to show-quality, with a surprise or two up its oversized sleeves. 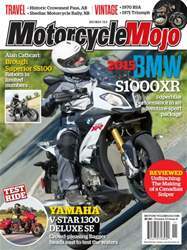 All this and much more in the November 2015 issue of Motorcycle Mojo.